Baku, Azerbaijan, March 25, 2012. 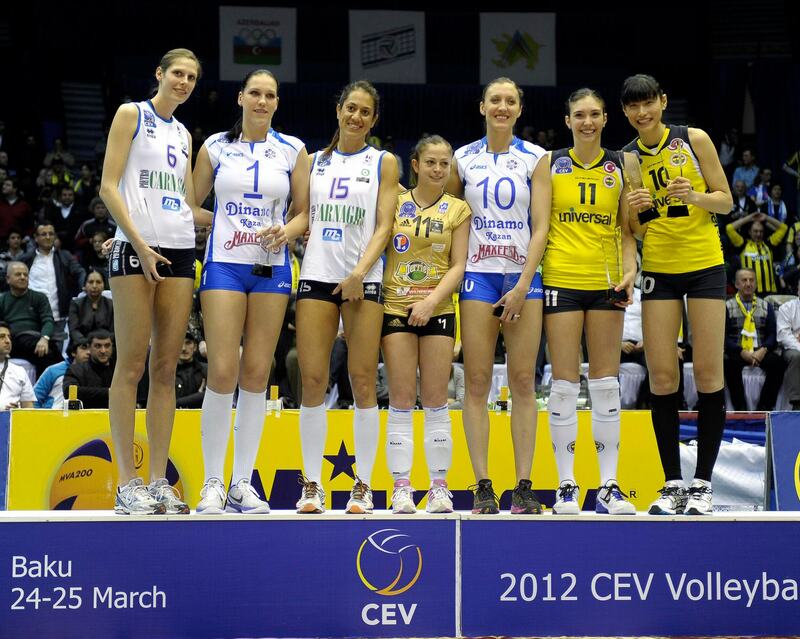 The “yellow angels” of Fenerbahce finally fulfilled their dream and delivered a terrific show in the final match of the 2012 CEV Volleyball Champions League in Baku downing France’s RC CANNES in three straight sets (25-14, 25-22, and 25-20). Their supremacy was overwhelming and there is a name that all Volleyball fans will have to get quickly familiar with: Korean Kim Yeon-Koung anchored her side to a historic win and will be remembered as the real star emerging from this final four whereby “Fener” becomes Turkey’s second club to claim the most prestigious club competition after their compatriots of Vakifbank had done so last year in Istanbul. Some four months after the start of a long and very demanding campaign, the top teams emerging from such an incredible adventure were supposed to deliver a classy Volleyball show as the title of Europe’s queens was to be assigned this afternoon in Azerbaijan’s capital city. In a repetition of what was already seen on Saturday’s semifinals, the “Heydar Aliyev” Sports and Concert Complex got gradually crowded by the many fans of Fenerbahce, all wearing – once again – their black and yellow scarves to contribute a pretty homogeneous look and feel in Azerbaijan’s largest sports hall. After barely missing their call in 2010 and having to settle for bronze last year as the final four was held in Istanbul, the players coached by Brazilian Zé Roberto were expected to profit of this chance to finally come out on top of the standings but their rivals of RC CANNES certainly were not going to let it go that easily. Additionally, this final match was a remake of the semi played two years ago in Cannes and whereby Fenerbahce had literally shocked the local fans by seizing the day after a tie-break whose memories are still well alive there in the French Riviera. The final match was officiated by a duo of female referees – Zorica Bjelic of Serbia and Germany’s Heike Kraft – and the atmosphere was evidently “hot” especially as the fans of Fenerbahce never stopped supporting their heroines with their choruses. The first rallies immediately set the tone of what was going to follow with continuous side-outs and the score remaining extremely tight. RC CANNES was the first to clip a margin of two points (9:7) but the “yellow angels” stormed back immediately anchored by their stellar Korean opposite Kim Yeon-Koung. Apparently Fenerbahce was not feeling the enormous pressure resulting from the “obligation” to win and another attack of Kim helped stretch the margin up to three points (14:11). The French ladies displayed some great defense but it was not that easy to stand the quality and intensity of the play delivered by the Turks who were dictating the tempo of the game also by the second mandatory stop (16:12). After a fantastic performance in yesterday’s semifinal with Dinamo KAZAN, Kim was once again on a class of her own: a crosscourt, an ace and a great defense of the Korean star seized the next 3 points for Fenerbahce (20:13) that was rapidly sailing away while the Chinese-born mentor of RC CANNES, Yan Fang, was getting visibly nervous as his players were losing focus and looked unable to stand that terrific storm. Another ace of Kim moved the count up to 23:13 and Brazilian middle blocker Fabiana Claudino wrapped it up only a few seconds later for the 1:0 (25-14). That tremendous show of strength continued also in the second set (3:1) where Kim re-opened the gap for Fenerbahce moving the score from 10:9 to 13:10. RC CANNES played bravely enough to be able to fight back and make it a little bit more even and exciting (17 all). However, the personal show of Kim continued as the final rush of the second set was quickly approaching (21:17) and even Nadia Centoni had to crash against the wall of Fenerbahce block, with Eda Erdem being well supported in this fundamental by setter Naz Aydemir. It was not by chance that Fenerbahce had edged – with two wins in straight sets – the 2011 club world champions of Rabita BAKU in the 1/4 finals: the ladies in yellow jerseys were just an express that was running at full speed straight to the final station of this journey, with a pipe of Kim significantly finishing it off – at least for the second set – with the score of 25-22. Quite understandably Fenerbahce suffered a drop of concentration in the opening phases of set 3 (0:3) but that chase did not last that long with Logan Tom eventually moving her side to the front as she killed a great spike from the left wing (9:8). It looked like Fenerbahce – after winning the FIVB Club World Championship in 2010 – was going to follow the compatriots of Vakifbank on top of Europe’s Volleyball elite; the supporters from Turkey’s megalopolis had already started their party on the stands as the score stood at 15:13 for their heroines after Kim had displayed some more magic with a delicious lob to avoid the French block and surprise the defensive line of CANNES. All stats were clearly speaking in favor of Fenerbahce and another pipe of Kim followed by a fast of Erdem paved the way with gold for the Turks (19:15). Turkish music was being played at “Heydar Aliyev” sports hall as Fenerbahce was missing only four points to fulfill its dream and a sort of countdown started as Erdem aced for the 22:17. Yan Fang tried out many substitutions but this final remained one-sided up to the very end, with the well-deserved 3:0 being sealed by an attack of – guess – Kim Yeon-Koung, MVP and absolute star of this final (25-20). Istanbul, Turkey, February 29, 2012. Fenerbahce Universal ISTANBUL downed once again the 2011 club world champions of Rabita BAKU in front of a massive crowd of 5’200 fans at “Burhan Felek” Volleyball Hall to pocket a ticket to the final four of the 2012 CEV Volleyball Champions League that is scheduled for next March 24-25 in Azerbaijan’s capital city. That was the second consecutive 3:0 win (25-20, 25-17, 25-20) for Fenerbahce after the previous match in Baku had ended with the same score. Rabita had to recover from that shocking home defeat from last week and opened pretty well by going up 8:7 at the first technical time-out of the opening set; however, some errors of Natalya Mammadova turned the charts around and Fenerbahce quickly got control of the operations with Korean star Kim Yeon-Koung scoring 8 points all alone in this section of the game. Fenerbahce trailed 2:5 in set 2 but drew level at 6 all before US American Logan Tom contributed a great break moving the score up to 16:10 for the home side, paving the way for the final 25-17 for the so-called “yellow angels”. The hosts opened strong in set 3 (6:3) but Rabita bounced back to level at 11 and go up 14:11 before Fenerbahce restored its dominance and could finish it off in straight sets (25-20) with Kim amassing a total of 23 points in the game. “Tonight we did a good job and routed our opponents, but we still have to improve the quality of our game for the final four” singled out a happy head coach Zé Roberto. “Although they have some great players, we have improved much since the start of the season and have become a real team. My teammates deserve a lot of praise for what they did tonight” said team captain Seda Tokatlioglu. In one of the most exciting games in Top 16 history, Fenerbahce Ulker rallied from a 13-point fourth-quarter deficit to edge Unics 94-87 in overtime in front of almost 12,000 fans at Ulker Sports Arena in Istanbul, Turkey in Group G on Thursday. FB Ulker needed to win by 6 points or more to stay alive, regardless of other results. Bojan Bogdanovic paced the winners with 20 points, but Roko Ukic became the game hero with a buzzer-beating floating jumper to send the game to overtime. Ukic added 18 points, Emir Preldzic had 13, Gasper Vidmar got 10 and Mirsad Turkcan pulled down 13 rebounds for FB Ulker, which improved to 2-3. Lynn Greer led Unics with 33 points, tying the third-best scoring mark in Top 16 history. Greer had a performance index ranking of 43, also tying for third-best with Terrell McIntyre in Top 16 history. Mike Wilkinson added 17 points, while Henry Domercant had 13 for the guests. An outstanding Greer allowed Unics to get a 21-26 edge after 10 minutes. FB Ulker trailed throughout the second quarter, but a three-pointer by Marko Tomas gave the hosts a 53-52 edge. It didn’t last long, as a 2-16 run that Greer capped with an unbelievable buzzer-beating three-pointer from way downtown gave Unics a 55-68 margin after 30 minutes. Unics still led 73-79 with 1:23 left, but a 6-0 run that Ukic capped with a floating jumper sent the game to overtime, 79-79. Gasper Vidmar, Emir Preldzic and Bogdanovic took over in the extra period to lead FB Ulker to an unbelievable, exciting win in epic fashion! Vidmar got FB Ulker going with free throws that Greer matched with a driving layup for a 2-2 tie. Domercant shined with an off-balance jumper but back-to-back driving layups by Bogdanovic and Roko Ukic put FB Ulker back ahead, 6-4. Ukic kept pacing the hosts with a huge basket in transition but Greer struck from downtown to keep Unics within 8-7. Ukic took over with another driving basket that Aleksey Savrasenko matched with a layup. Wilkinson sank a corner triple but Bogdanovic hit a one-handed jumper in the lane for a 12-12 tie. Greer made foul shots and a layup by Wilkinson made FB Ulker call timeout at 12-16. Engin Atsur nailed a triple only to see Greer beat the shot clock buzzer with a floating layup, good for a 15-18 Unics lead. Kelly McCarty made a close shot and Wilkinson scored again. Three-pointers by Tomas and Preldzic kept FB Ulker as close as 21-22. Greer made free throws and a layup by Savrasenko gave Unics a 21-26 edge after 10 minutes. Wilkinson hit his second three-pointer early in the second quarter, but FB Ulker improved its defense. Meanwhile, Ukic sank a close shot and Oguz Savas scored down low for a 25-29 deficit. Wilkinson made free throws that Savas erased with a tip-in. A red hot Wilkinson swished another triple, as Unics kept circulating the ball well to find open shots. Preldzic hit foul shots and a layup by Bogdanovic forced Unics to call timeout at 31-34. Both teams had entered the foul bonus, which forced the coaches to change their defensive strategies. Bogdanovic split foul shots and a put-back basket by Savas got the hosts even closer, 34-36. Greer hit free throws and after Mirsad Turkcan sank a long jumper, a power basket by Domercant restored a 36-40 Unics edge. Ukic and Domercant traded driving layups and a corner jumper by Bogdanovic got FB Ulker a bit closer, 40-44. Domercant scored in penetration, but Preldzic fed Kaya Peker for a layup that fixed the halftime score at 42-44. A put-back dunk by James Gist tied the game at 44-44, right after the break. Greer shined with a put-back layup and a driving basket for a 46-48 Unics lead. Ukic took over with an off-balance shot in transition and collected a steal that allowed Peker to give the hosts a 50-48 edge. Greer stayed unstoppable with free throws and Domercant downed a jumper but a three-pointer by Tomas back FB Ulker back ahead, 53-52. Greer buried another three-pointer as Unics tried a stronger frontcourt with Wilkinson and Nathan Jawai together on court. Atsur and Peker combined for 1-of-4 foul shots, but back-to-back layups by Jawai gave the guests some fresh air at 54-59. Terrell Lyday, who had been scoreless until now, took over with a wild layup-plus-foul and an unstoppable Greer buried a triple and banked in a double-pump bomb from almost midcourt to break the game open, 55-68, through three quarters. Ukic tried to ignite the hosts’ comeback with a quick basket early in the fourth quarter. Unics, however, kept locking the defensive board and running its offense through Greer. He found Jawai for a layup that Preldzic matched with a driving basket for a 59-70 FB Ulker deficit. Bogdanovic soon added a bomb from downtown to make Unics call timeout at 62-70. Vidmar took over with a put-back slam, as Unics struggled to score right when it mattered. Meanwhile, a floating jumper by Ukic made it 66-70 with under 6 minutes left. Domercant silenced the crowd with a big triple, but Vidmar quickly answered with a jump hook and Tomas struck from downtown to set the crowd on fire, 71-73. Vereemenko dunked, however Turkcan erased it with free throws. Veremeenko kept shining in crunch time, following a backdoor layup with an off-balance basket that seemed to seal the outcome, 73-79, with 1:23 left. Preldzic and Bogdanovic made free throws to bring FB Ulker within 77-79 with 25.5 second left in regulation. Wilkinson missed foul shots and Ukic beat the shot clock with a rainbow jumper that sent the game to overtime, 79-79, setting Ulker Sports Arena on fire. Vidmar hit a jump hook early in the extra period and Greer split free throws for an 81-80 Unics deficit. Turkcan stepped up with a put-back layup that Wilkinson copied in the other end and a free throw by McCarty tied it again, 83-83, with three minutes to go. Bogdanovic shined with a turnaround jumper, as Unics kept missing shots down the stretch. Vidmar split free throws, grabbed his own offensive rebound and went 1-of-2 from the line for an 87-83 score. Another Unics turnover sent Preldzic to the foul line to give FB Ulker an 89-83 edge with under a minute left. More free throws by Preldzic and Bogdanovic allowed FB Ulker to get a 94-87 lead with 6 seconds left. Unics had a last chance to survive a tough test and keep its chances alive in unbelievable fashion, but was unable to convert and the hosts celebrated a wild win! Baku, Azerbaijan, February 22, 2012. Last year’s bronze medalists of Fenerbahce Universal ISTANBUL somehow shocked Azerbaijan’s Volleyball family this afternoon at “Sarhadchi Olympic Centre” by downing the 2011 club world champions of Rabita BAKU in straight sets (25-13, 26-24, and 25-19) in the first round of action for the 1/4 finals of the 2012 CEV Volleyball Champions League – Women. Fenerbahce opened with strong services provided by US American Logan Tom and even though Rabita gradually found momentum, still the first set was sealed with a massive 25-13 by the guests from Turkey. Rabita’s reception was not consistent also in set 2 and even though the Serbian duo composed by Sanja Starovic and Mira Golubovic did their best in order to re-group their side, still Fenerbahce dominated the scene mainly via the spikes of Korean Kim Yeon-Koung. That same trend was maintained also in set 3 and Fenerbahce could eventually celebrate a great away win, while Rabita will have to turn the tables around next week at “Burhan Felek” Volleyball Hall to qualify for the final four that is scheduled for late March in Baku. “We played poorly and we did not expect such a result” says home captain Natalya Mammadova. “But this is Volleyball and it can happen. However, we want to deliver a good performance next week also to the delight of our many fans” she adds. “We did not play at all while Fenerbahce did a good job in service and reception” stresses Rabita mentor Zoran Gajic. “However, if we can play our best next week in Turkey as we shall do, we still have a chance to continue our campaign”. “We played a good match but to be honest we did not reckon with such a result. This victory makes us very happy” concludes Fenerbahce captain Seda Tokatlioglu. Fenerbahce didn’t lose a game in Round 1 of the EuroLeague Women and they’re still the only undefeated team in the competition after an 83-71 victory over Lattes Montpellier on the opening night of play-off action. Penny Taylor poured in 24 points and Ivana Matovic 20 as Fener rolled to a convincing triumph. The Turkish giants stormed into a 26-8 lead late in the first quarter with Matovic scoring eight points. Taylor and Angel McCoughtry had six apiece as the hosts took command. The French outfit didn’t quit and went on a 6-0 run to close the gap to 59-48 with 2:22 to go in the third quarter. A Diandra Tchatchouang basket reduced the arrears to 62-52 at the end of the frame. Taylor started the fourth with a pair of free-throws, though, and Zane Tamane took the advantage to 14 with a jump shot as Fenerbahce maintained a comfortable advantage. The visitors continued to scrap and reduced the arrears to 73-65 with 4:49 remaining on a fast-break lay-up by Kristen Mann. The basket forced Fener coach George Dikeoulakos to call a timeout. When play resumed, Matovic scored and Tamane followed with a basket to extend the lead back to 77-65 as Fener maintained control. Tamane ended up with 15 points and nine rebounds, while Montpellier got 20 points from Mann and 13 from Sacko. Panathinaikos took a big step towards the playoffs by dominating Fenerbahce Ulker 72-62 at OAKA Arena in Athens. The Greens are now tied for first place in Group G with a 3-1 record. Panathinaikos led from start to finish, using tough defense to hold the visitors to 27 points in the first half and force many of Fenerbahce’s 21 turnovers. Despite spotty play, the visitors never gave up and managed to cut the lead to 9 points in the fourth quarter. Veteran Kostas Tsartsaris, starting for the injured Steve Smith, paced the winners with 21 points, while Mike Batiste knocked down 11 and grabbed 6 rebounds, and Ian Vougioukas and Romain Sato each contributed 9. Bojan Bogdanovic led FB Ulker with 15 points, Roko Ukic tallied 13 and Curtis Jerrells added 11. Mirsad Turkcan notched a game-high 13 rebounds in defeat. Panathinaikos got off to a 8-2 lead on layups by Kostas Kaimakoglou and Romain Sato, who added a three-pointer. After a jumper by Jerrells and foul shots by Batiste, Ukic hit a running one-hander in the lane to keep the visitors in the hunt 10-6. Bogdanovic drilled a triple from deep, but free throws by Dimitris Diamantidis and a layup and more foul shots by Tsartsaris kept the hosts out front 17-9. Batiste knocked down a baseline two-pointer and Tsartsaris hit a pair of short-range shots, while Bogdanovic downed foul shots and Kaya Peker banked in a layup, the last points of the quarter, as Panathinaikos took a 24-13 lead. Tsartsaris kept scoring to open the second quarter, this time from downtown, then David Logan got 2 points on a fast break, extending the hosts’ margin to 29-13. A Peker layup ended the Panathinaikos surge, then Emir Preldzic split free throws and Engin Atsur put in a back-door layup to trim the lead to 29-18. After Diamantidis and Batiste each added a two-pointer, Jerrells sliced his way to the basket and added a foul shot for a 34-21 difference. Batiste and Bogdanovic exchanged baskets, then Sato drilled a triple from the corner, giving the hosts a 38-23 margin. Fenerbahce tried to make a game of it as Ukic layed it in and Bogdanovic hit a mid-range jumper, pulling to 38-27. But the hosts had the last word as Sarunas Jasikevicius banked in a short jumper to take 40-27 halftime lead. Tsartsaris opened scoring with a left-handed layup, then Diamantidis buried a three to widen the hosts’ lead to 45-27. Ukic answered for the visitors with 2 points in transition, then Jerrells added a pair of layups to cut the difference to 47-33. Free throws moved the scoreboard, then the hosts’ Ian Vougioukas hit a baseline hook shot and Ukic banged home a triple to set the difference at 53-37. Nick Calathes got his first points with a steal and layup, then Fenerbahce scored 6 straight on baskets by Turkcan, Bogdanovic and Ukic, slicing the lead to 55-43. A driving Kaimakoglou dished the ball to Vougioukas in the paint, who banked in a layup and added a foul, giving the hosts a 58-43 lead at the end of 30 minutes. The first 6 points of the quarter belonged to Fenerbahce on free throws by Oguz Savas, another drive by Jerrels and a dunk by Bogdanovic, cutting the deficit to single digits 58-49. But then Panathinaikos erupted with an 11-2 surge, as Vougioukas hit free throws and added a basket in the paint, Jasikevicius drained a triple and Tsartsaris finished a drive with a dunk, then added another layup to set the score at 69-51. Fenerbahce refused to fold, responding with a 9-point run, including a triple by Turkcan to reduce the deficit to 69-60 with 2:18 on the clock. But after Atsur missed a three-pointer to get closer, Batiste erased any chance of a comeback by nailing a rare bomb from downtown with 50 seconds on the clock as Panathinaikos earned a convincing 72-62 victory.